GTECH, along with area veterans and Sierra College administration, celebrated the opening of a brand new technology center today at the Sierra College Veterans Center (SCVC) in Rocklin with an official ribbon-cutting ceremony. The centers technology was donated by GTECH. This donation is part of GTECHs Technology Giving program, which provides educational opportunities to local community members by donating state-of-the-art computers, printers, software, furniture, and volunteer hours to non-profit organizations that sponsor educational programs in California. I would like to thank GTECH for their generous donation to our student veterans, said Sierra College President Willy Duncan. The donation was instrumental in the creation of the new Veterans Center which will provide centralized services dedicated to their success. Student veterans and their families will be able to find assistance with their educational plans, financial aid, GI benefits, and employment opportunities in one location. GTECHs contribution has made a real difference in the future of these students. As part of the donation, the SCVC received seven desktop computers, a big screen monitor for group instruction, two state-of-the-art color printers, and partially funded new furniture, and a remodel of the center, including the installation of new carpet. The Center is available to the veterans and their families as a safe and supportive environment where they can conduct job searches, apply for positions online, take online college courses, and better their computer skills. This donation is a perfect example of a way to honor our countrys soldiers when they come home," said CA Assemblymember Beth Gaines. I applaud GTECH for this generous gift which will give the veterans opportunities they otherwise may not have had. The Sierra College Veterans Center has opened many doors for these men and women, and they are more than deserving of the state-of-the-art technology upgrades this donation has provided. Our nations veterans are to be commended for their bravery and dedication to protecting all of us, said California Secretary of Veterans Affairs Peter James Gravett. 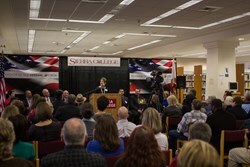 What better way of saying thank you than with the services of veteran centers like the one here at Sierra College. This donation from GTECH is sure to enrich the lives of the veterans and their families while they are transitioning back into civilian life. The SCVC provides services and support for our nations soldiers who seek educational and career opportunities. Veterans receive hands-on assistance from veteran peers, counseling faculty and community volunteers as they transition from boots to books. The SCVC provides assistance with college application and registration, GI Bill benefits, mental health awareness training, community service opportunities, tutoring, internships, as well as referrals to veteran and community resources, job search services, and many other services and resources. GTECH is proud to partner with the Sierra College Veterans Center to help support our nations heroes on their path to educational and career success, said Denise Kimes, GTECH California Account Development Manager. These veterans have put their lives on the line to protect our country, and this donation is our way of thanking them for all of the sacrifices they make to keep us safe here at home. We are also very thankful to the SCVC for their support and dedication to the veterans futures. The facilitation of this donation and partnership was also made possible by the VetFund Foundation, a 501c3 that promotes the interests and raises money in support of California veterans and active service members, services, and the programs of the California Department of Veterans Affairs. GTECH Technology Giving program donates, on average, $ 15,000 worth of state-of-the-art technology, furniture, and volunteer hours to non-profit organizations that sponsor educational programs across the country. GTECH Technology Giving program is modeled after GTECHs global After School Advantage program that began in 1999. The GTECH After School Advantage program aims to narrow the digital divide between affluent citizens and minorities, low-income households, and single parent families, to grant more children and teens access to computers and other educational opportunities. To date, more than 200 After School Advantage computer labs have been opened in 24 states, the District of Columbia, Canada, Chile, Colombia, Jamaica, and Trinidad and Tobago. For more information, please visit http://www.gtechlottery.com.